Pretty version of this hardy perennial impatiens. It forms mounds of lush foliage that has a light icy sheen on the surface of the leaves. If you look closely at this cultivar the leaves actually sparkle as if they were inlaid with crystals. Groovy. To 2′ x 3′ spreading in part shade to shade in rich, well drained soil. Consistent summer moisture. In autumn the tops of the plant bears many tubular light yellow flowers that are surprisingly large. Completely winter deciduous. 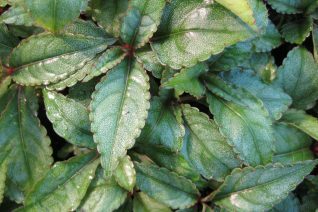 People love this perennial (hardy) Impatiens- they are immediately drawn to its very pretty foliage and for most of the season thats all there is. Spreading as a low herbaceous perennial to just 16″ tall but many feet wide when happy. Rich, loose, hummusy rich soil that drains quickly with regular irrigation. Part shade to quite a bit of shade. Ideal under large shrubs, in shady spots. Each pointed leaf is minutely scalloped with a red to yellow central vein. The undersides of the leaves are madder red. In autumn relatively large tubular ( or police helmet shaped) flowers of soft yellow appear at the tips. The show is late and to be honest most people kind of miss it. Completely winter deciduous. Avoid blasting hot sun and compacted soils. 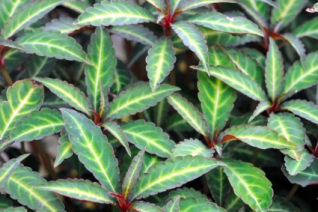 Large, bold foliage perennial for shade. 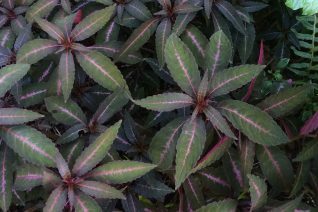 Vigorous dome forming plant with large maroon/green leaves with a central pink mid-rib. In mid-autumn subtle but large light yellow flowers appear. To 2′ x 3′ for rich, well drained soil and regular summer irrigation. Good drainage is helpful as well. Contrasts nicely with gold leaved plants. Avoid hot sun and dry conditions. Great with an annual application of compost. Winter deciduous. More vigorous and shower than the species. Great under large established shrubs. Winter deciduous.